Marking the center of a wheel is a very easy thing if you have the right tool for it. You can buy tools similar to this for as much as $25.00. 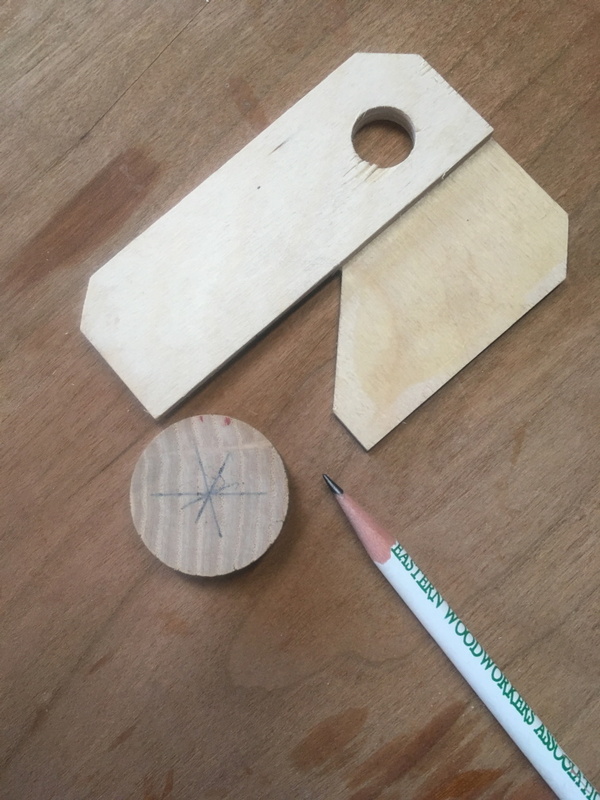 For a few cents worth of material and less time than it would take you to order one, and certainly less time than it would take to wait for the UPS truck to arrive, you can make this simple center marking gauge. This center marking jig will work on square, octagonal or round stock, finding the exact center every time. It is useful for wood turning, but also for making small wheels in toy making. Normally the center is found by making two lines at 90 degrees to each other. That I made several intersecting lines that meet at the exact same point, assures me that the jig is dead on. My center finding jig is made of 1/8 in. thick Baltic birch and the hole is drilled so that it can be hung for storage and also so it will be known to not be a piece of scrap wood available for student use. I am revisiting my chapter on making wheels, simplifying, and improving. This jig is part of that process. 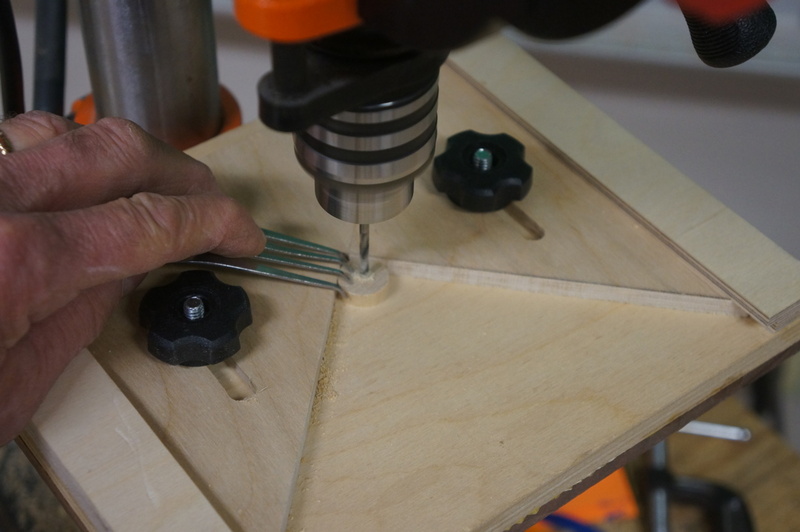 You will find it best to drill the axle hole using a brad point bit. Make, fix, and create. Devise opportunities for others to learn lifewise. My earnest desire has been to make it practical in all respects, and the labour has been cheered and lightened whilst feeling that this little book might become the medium of instilling into the young habits that would lay the foundation of usefulness in after life. Let us hope that's the case. Think of the millions of children these days whose fingers and thumbs are engaged in useless digital manipulations. Let's remember that hands are to be usefully engaged in service to family, community and self. Make, fix, and create. Assist others in learning likewise. Using a fork as hold down. I made a new wheel drilling jig for use at school, and to keep hands safe, I came up with an ingenious method of holding the work. Using a stainless steel fork like you can find cheap in any thrift store in America, I bent the tips of the tines at 90 degree angle to get a firm grip. The stainless steel fork has a bit of "spring" in the tines, making it perfect for the task. Yesterday while I was at work in the school wood shop, one of my second grade girls showed up, gently knocking on the wood shop door. She wanted to borrow a screwdriver. "Straight or phillips," I asked. "Straight" she said. She had come to school with her mother to do the school's payroll, and had brought a bunch of stuff in a bag with the plan of taking things apart. "Lovely," I thought. An engineer or scientist or artist in the making. Barbara Bauer alerted me to an article https://slate.com/human-interest/2018/12/homemade-toys-19th-20th-century-america-pictures.html that alerted me to a website http://www.survivorlibrary.com/index.php/8-category/142-library-toys to a book, The Boy's Own Toy-Maker, E. Landells, 1860. "This is a boy's book in which the author has tried with his pen and pencil, to teach some useful things for the pleasant time of play hours. 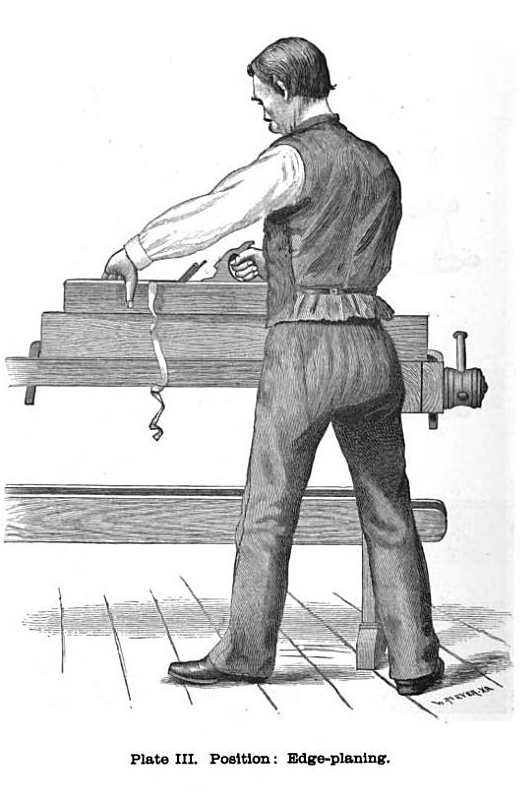 It is a plain book, which he hopes will be easily understood by any boy old enough to be trusted with such common tools as a penknife or a pair of scissors, and still be equally suited for the pastime of those who, of riper age, aspire to manlier amusement." Of course the contents of the book could be just as well used by girls, but that thought would not fit so well in the time it was written. The book also points to the practical value of the toys children have made in the development of their intelligence for later things. "All children in a degree love to construct, and this surely points to a most practical means of conveying instruction when you provide amusement. 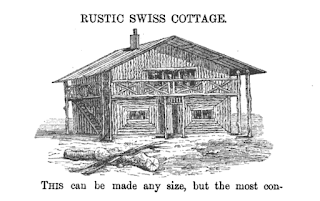 The boy engaged in making a toy-house becomes half an architect in the knowledge acquired of the names and uses of forms and materials which, without a model, he could hardly comprehend. How he forms a tiny boat or cutter, and rigs it himself, acquires a familiarity with every rope and spar that belongs to the vessel he acquires a knowledge which, without going so far as the island desert, may any day of life be of valuable service to him who inhabits an island home. Knowledge is power; the more practical it is the more powerful will it be for our good and for that of our fellow-beings, and it is hoped that our young readers will have reason to remember with a kindly regard among the thousand common circumstances of life, the instruction imparted in these pages." Enough said, perhaps. A few wise words ought to suffice, if given to the wise. Given the state of America education, likely it will not. Yesterday I mentioned the Spanish conquest of the Incan civilization and the brutality through which the Spanish attempted to obliterate a culture even as they plundered its riches. Let us celebrate the good parts of the message of Christ, and fess up to the evil done in Christ's name, just as we recognize the good ideals put forth by our founding fathers as we fess up and try to improve the relationship between the US and the world and between ourselves and each other. Let us learn to give to each other, to trust each other and to build upon ideals. Those are: the fellowship of human kind, respect for all life, and the right worship as we see fit whether we do the bulk of it in the forest, the classroom, the wood shop or in the shopping mall. We each are born with the responsibility to care for each other. In my home woodshop, I'm working on a new jig for drilling wheels that may be included in the book if it offers some hope of being an improvement, making wheel making easier for kids. The idea is simple even though it took a long time to arrive in my thoughts. The photo shows the start of the jig. It will fit over the drill press table, but I don't expect you to understand how it works until you see it in use. Yesterday on the radio (NPR) they were talking about the need for human beings to be able to colonize other planets. Some of their planning is based on accepting an understanding that we've so badly screwed up own planet, that we need someplace to escape to. To those who would go to Mars, I have this wish. Get off your computer and take a walk into the real world. Then having witnessed the wonders of it, get off your posteriors and apply yourselves to protecting what we have. Certainly we would learn a few things by attempting to live on another planet. But how about attempting to learn a few things from living on earth? And by taking better care of what we've been given? 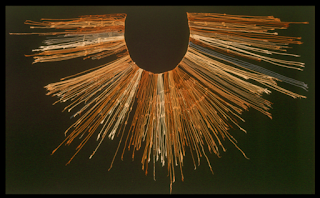 Using knotted strings, called quipu, the Incan people kept records of their culture, including stories and transactions. At this point in time, due to the purposeful destruction of the Incan culture, little is known about how to actually read Quipu. As a bystander, I'm intrigued whether or knot the hands may have the key, and whether or not what is recorded about Atahualpa's encounter with the conquerors might be instructive of a thing that's lost. Could it not be true that trained hands might read Quipu, even in the dark, by pulling slender knotted threads through one's fingers? Atahualpa saw no value in the sacred book offered by the priests because it said nothing of truth to his hands and touch. Of course, this is conjecture and it will take scholars to determine the truth if any are interested. A graphic novel by Nick Sousanis came to my attention. It is called "Unflattening" about which is said, "The primacy of words over images has deep roots in Western culture. But what if the two are inextricably linked, equal partners in meaning-making? Written and drawn entirely as comics, Unflattening is an experiment in visual thinking." I will go a step further and suggest that even visual images on a page are also flat. It truly takes touch to bring human experience to life. And so, what if we were to make a leap of faith, and accept what our hands know to be true. Our hands are not dumb slaves to the eyes and mind. They are the proof that emerges as essential to an understanding of reality and our place within it. Make, fix and create. yes, please. I received the January 2019 edition of the Woodcraft Catalog, and has it grown massive since I began woodworking. It has many times more interesting tools to choose from, and in that things are much more complicated than when I began my career as a woodworker. The Woodcraft Catalog has always been a source of inspiration. On the other hand, there are very good reasons to keep things simple. 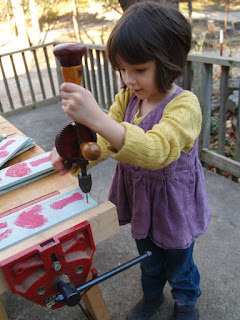 A hammer and a saw and a bit of wood can keep most folks learning for decades. Joni Mitchell had sung about the thumb and the satchel, and the crazy you get from too much choice. Take care in your acquisition of tools. Choose well and avoid the tool craziness that can keep you from getting anything done. I also received a copy of a book published by the University of Arkansas Press about the work of my friend Robyn Horn. 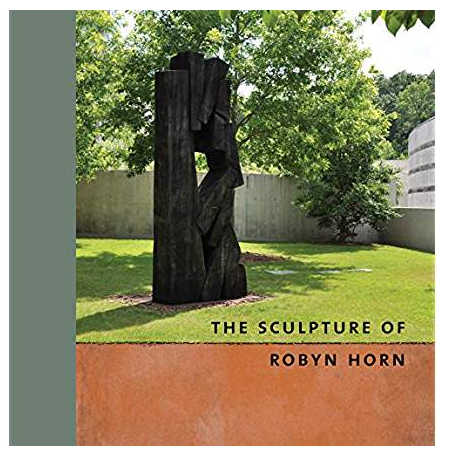 In The Sculpture of Robyn Horn, A variety of experts in the field of crafts (and art) offered their introductory remarks that should help readers to better understand the work displayed throughout the book in wonderful photos. 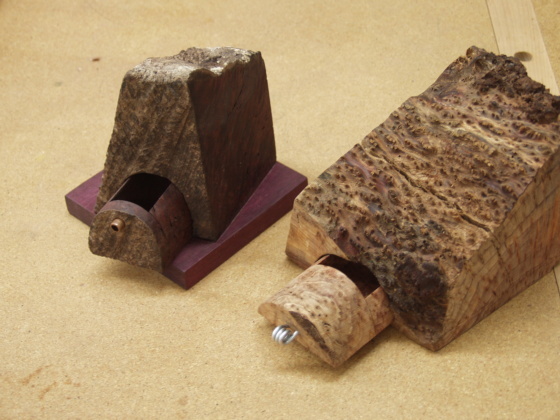 This video is from Fine Woodworking showing how to make a shrink pot box. https://www.finewoodworking.com/2018/11/28/video-greenwood-shrink-pots-quiet-version Due to drying time you would not likely have one finished for this Christmas, but there are other boxes you can make in little time. Some of those boxes will be featured in my book about Woodworking with kids. A few days before winter break, one of my students brought in a small box full of something he wanted to show me. It was the box interested me most. It was a leather hinged box he had made in wood shop and then left in the woods outside his home. It had the appearance of an ancient artifact. And it's nice to witness how the things my students make have an expanded role in their lives. When we make something, we do much more than make an object. We engage in making ourselves as craftsmen. Today I'll be cleaning my wood shop. I dreamed last night that I ascended a very long dark staircase and opened a door into a softly lit room. There was a table and a lamp, glowing in welcome. As it appeared to be the home of others, I closed the door and descended down into the street. Where do such dreams come from? I had been thinking of an old friend, who likely occupies a room like that. He had led a meditation group in Springdale of which I had been a part. It was suggested of him, that he had spiritual powers. He made no such claims. His purpose was to build a group of awareness in which each person might be of some support to the others and that each might thereby grow in consciousness. We have something that sort of resembles that now with facebook, instragram and all. We connect with each other over networks and wires and in rooms in which folks gather in denial of others outside the group, and hold tightly to their opinions, regardless of how much they are thereby restrained from a direct encounter with the facts. One thing I can say about my friend in Springdale, he was kind and had no pretense. He thought only of others and little for himself. He did not seek to place his on name on top of things. And thereby one can learn the difference between a wise man and a charlatan. There is a humility to be found in craftsmanship. You try something and it fails and you, having acknowledged your mistakes, attempt to make ammends. The craftsman's best tool is forgiveness. To those locked in dark chambers of their own making, I advise, carefully avoid arrogance. It is what sets human beings apart. 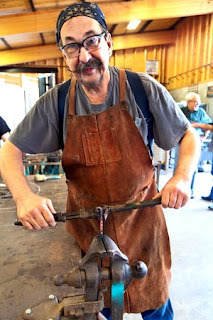 You can find the Arkansas Made article about ESSA here: http://www.arkansas-made.com/essa-goes-big-18 The photo of Dale Custer teaching blacksmithing is from that article. Being off from school this week, I'm going through old photo files from the Wisdom of the Hands program at Clear Spring School. The archives are deep, including a variety of bandsawn boxes made from scraps provided by a friend. Make, fix and create... Assist others in learning lifewise. Rosie tried the trick once and it was only after a number of attempts she was able to pick both up at the same time. To her it was not a trick, but something that needed to be done. She decided on her own to perfect the trick by practicing it over and over again. In order to get the balls in her mouth at the same time, she has to hold one ball in the side of her mouth while she positions the other ball with a paw. Then she has to open her mouth just enough to add the second ball without dropping the first. Q. What gets into a dog that would make it want to perfect a trick like this on her own? A. The same thing that gets into each if us to drive learning and differentiation. Children and dogs each feel the need to be good at something. They need not all be good at the same tricks, and it is best that they not be. The future of the planet is dependent on sustaining diversity of species and thought. We are down to just a few making days before Christmas. This being the time of year for reflection, I'm planning new things for the coming year. Readers asked about the kids making the delivery of toys to the food bank. This year all the students were tightly scheduled for rehearsals for the holiday program, and so I rather unceremoniously made the delivery alone. In the past I would take a group of 1st and second grade students with me to make the delivery. But the program, attended by family and friends is also important. The class of 5th and 6th grade students shown took the lead in this year's project. All the other classes joined in and I could not resist making a few myself. We have about 9 making days before Christmas. Today I hope to clean shop. Yesterday I delivered toys made by our students to the local food bank to be given to kids. Two men were cooking the community meal when I arrived and they were excited to see what our students had done. They treated my arrival like I was a celebrity of some sort. Our students were proud of their work and I felt proud of what they had pitched in and done. When children have the opportunity to do real things in benefit to their community, they grow in character as well as in intellect. This year's toy making was a bit different from last year in that we made very tiny cars and trucks using wheels cut from dowels. The tiny vehicles are fun. and can ride in a shirt pocket. ESSA enrollment open now. Sign up for classes. Enrollment in ESSA spring and summer classes opened yesterday and there were a flurry of signups taking advantage of a 10% early enrollment discount. Go to this site: http://essa-art.org/workshops/ You will find classes of interest in nearly every area of the arts and crafts. The printed copy of the catalog will also be available soon. I offer classes in box making. 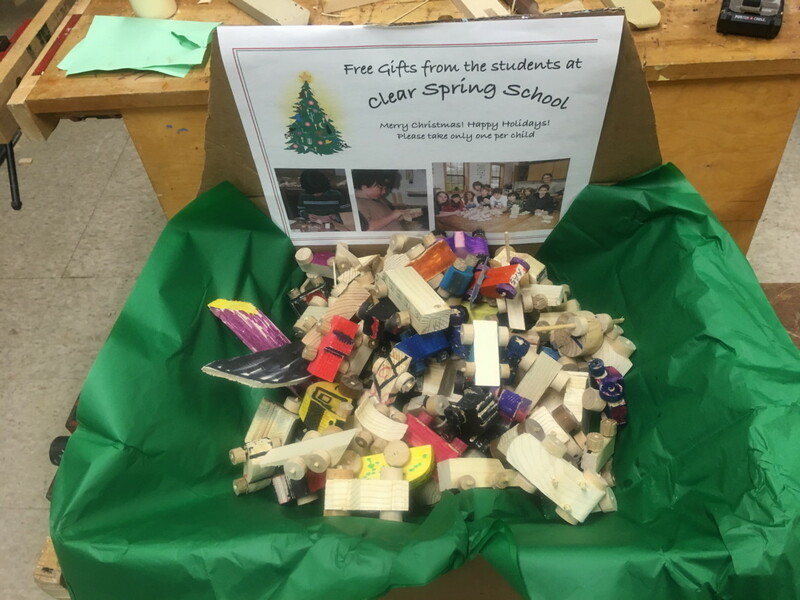 Today I will deliver toys to the local food bank that our Clear Spring School students have made, and our students will perform in the annual holiday program. Then for me, I'll have a few days to catch up on things around the house and in my woodworking business. We are also going full steam into the editing of my book about woodworking with kids. A friend noted his use of "21 Reasons Why School Woodshops are important in the 21st Century" in a speech to his local Toast master's Club. That paper, distributed by the Ne England Association of Woodworking Teachers can be found here: http://dougstowe.com/educator_resources/neawt21reasons.pdf I had helped write it. 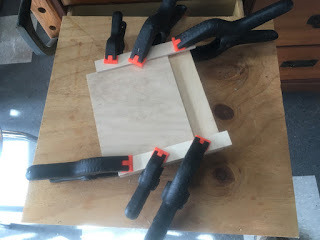 A few years back I had done an article for Fine Woodworking called "A better way to build boxes." Since then I've taught many classes and further refined my techniques, so I'm working on another article for the same magazine along the same lines. Repetition is the mother of invention and refinement. This fall, I made 80 engraved boxes to be sent as holiday gifts by the Chancellor at the University of Arkansas. I heard from a friend that her's had been delivered. Years ago, a spaghetti western starring Clint Eastwood was titled, the Good, the Bad and the Ugly. A similar title could be applied to modern technology. It may be more destructive than bad guys with guns, in that it may leave us mindless and brain-dead. (is that why zombie movies are so popular???) Having access to information is not the same as being smart. Having had experience and a way to apply and translate information is essential. 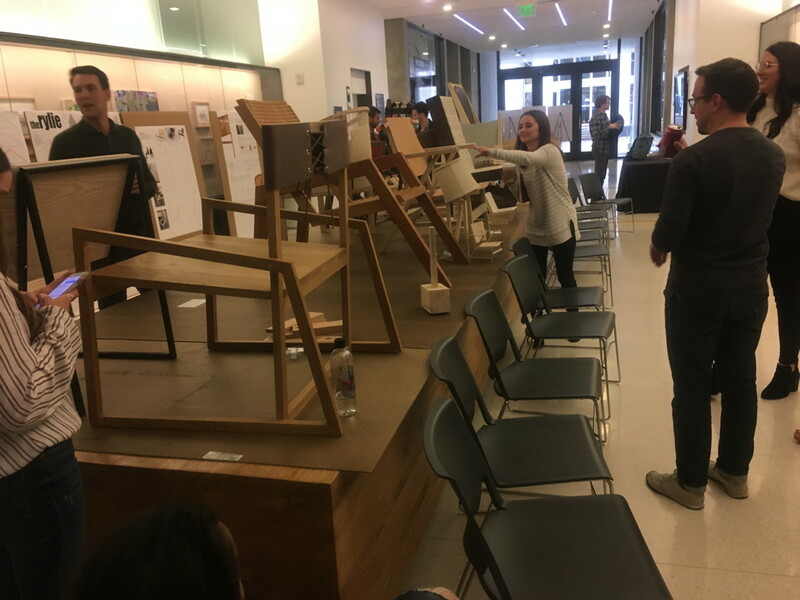 Last week I attended the furniture review panel for 5th year architecture students at the E. Faye Jones School of Architecture at the U of A. The students had been assigned some selected readings during the course of the semester, one of which was Matthew Crawford's book, Shop Class as Soulcraft. Crawford had used a quote from my blog as the opening to Chapter one. We could on the one hand, allow children to sit around all day on social media. Given the boring nature of conventional schooling, for many children that might be preferred. They'd not mind sitting around all day checking their Instagram accounts. The alternative is to give them real things to do, that offer meaning and growth. Wood shop is messy. It requires more band-aids than conventional classes. It can be noisy. But it can also be expansive of the child's understanding of the real world. In the German language new words are created by tacking one on the end of the other. One of my favorite long German words is Fingerspitzengefühl. Meaning finger tip feeling, "it describes a great situational awareness, and the ability to respond most appropriately and tactfully. It can also be applied to diplomats, bearers of bad news, or to describe a superior ability to respond to an escalated situation." It comes to the child from having both Wissenshaft, and Kentniss, two forms of knowledge, one having to do with real experience and the other derived from external sources, and the guidance to use those two forms of knowledge in problem solving. Sadly, the experiment involving the widespread implementation of digital technologies is too widespread to fight like gunslingers at the OK corral. We will attend to the wounded, by giving them real things to do. For example, a gift certificate to ESSA, the Eureka Springs School of the Arts might be a great gift for this holiday season. If you want to support either ESSA or the Clear Spring School, there are opportunities to give in the rescue of others. Scholarship support is needed at both schools. Any amount will be wisely used. essa-art.org or clearspringschool.org. In making your pledge, mention the wisdom of the hands. Make, fix and create. Assist others in learning lifewise. Screen time is having major effects on brain development in children. The American Council of Pediatrics has long warned about the detrimental effects. 60 Minutes described a major study to better determine its detrimental effect. One thing they pointed out was that it has long been assumed that on-screen learning would augment and enhance real world learning. What they found was that's not the case. There is no direct carryover from screen time into the ability to do real things. For example, stacking two dimensional blocks on screen give no ability to stack the real things. As I've mentioned before, there is no substitute for engaging children in the real world. There is danger at hand. First, it was noted that screen time is purposefully addictive and drives dopamine production to give a sense of pleasure that may not be as readily found in real world activities, particularly for those addicted to screen effects. Secondly, it was noted that screen time is directly associated with depression and anxiety. The simple point, is to unplug the device and spend real time in the real shop, with real tools, learning to do real things of benefit to family, community and self. 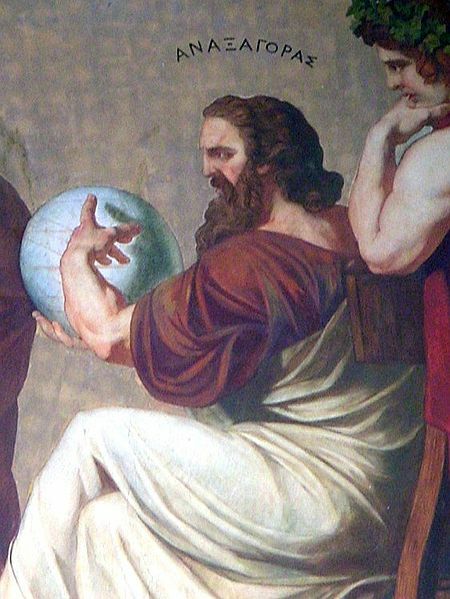 Anaxagoras had said that Man is the wisest of all animals because he has hands. He did not say we are wise because of Google. I'm not sorry to be so blunt. With the digital revolution we launched ourselves and our children into a vast experiment about which we are just beginning to learn the results and they don't look good. Make, fix, create. Turn off the instruments of destruction and get thee and thy children to the wood shop. 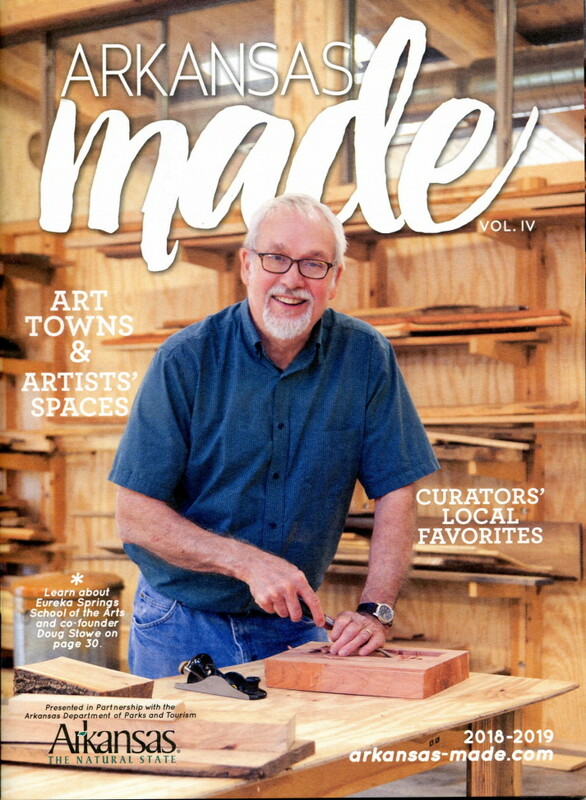 I am on the cover of "Arkansas Made" magazine that just came out. It is an annual publication produced by Arkansas Times and sponsored by the Arkansas Department of Parks and Tourism. The article is about the Eureka Springs School of the Arts. I hope it brings attention to the school, which is an absolutely wonderful place. Our wonderful city of Eureka Springs is also featured as one of the Art Cities of Arkansas. Come see us. In the next few days the 2019 calendar of classes will be going online. If you are looking for a holiday gift that will give a lifetime of pleasure, think "Gift Certificate." Hundreds of folks have had their lives enriched by experiences at the Eureka Springs School of the Arts. Thousands more have been touched by the arts of Eureka Springs. Yesterday I attended a furniture review panel at the Faye Jones School of Architecture as a guest. 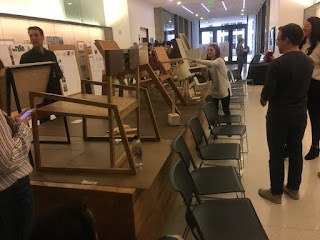 Fifth year architecture students displayed and discussed the chairs, lamps and mallets they had made in the department of architecture wood shop. All of the chairs were different, and all of the student presentations outlined their growth and the growth of their ideas. It was noted by all that it was challenging to go from the world of flat design to the realm of three dimensional object. A demonstration of that is crucial to an understanding that architects must have in order to be prepared to provide necessary detail to contractors. Chairs seem to have been a perfect exercise as the students contemplated going from their own bodies to what they wanted the chairs to look like and how they wanted them to feel. I hope to find other ways to be of service at the U of A, as I feel that I've made friends there. Volume IV of Arkansas Made came out this week as I discovered when I made a delivery to the Crystal Bridges Museum Gift Store. 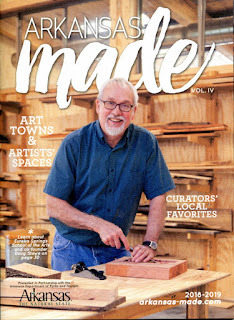 I am on the cover as part of an article about the Eureka Springs School of the Arts. Arkansas Made Magazine is published by the Arkansas Times in partnership with the Arkansas Department of Parks and Tourism. It is an annual publication. 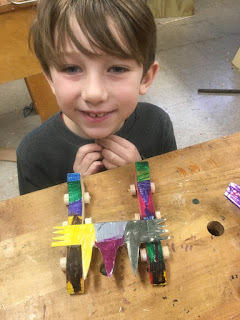 Today in the Clear Spring School wood shop, my students will be making tiny cars. This morning I go to the University of Arkansas to join a furniture review panel at the E. Faye Jones School of Architecture. As a long time woodworker I'll be looking at student work and have been asked provide feedback. I hope to be both useful and kind. I doubt that many there will know about Friedrich Froebel and his impact on the world of architecture. Froebel had hoped to become an architect at one point, but became a teacher instead. His impact on architecture was far greater than he would ever know. Frank Lloyd Wright, in his autobiography noted, "I can still feel those maple blocks in my hands to this day." There is a direct line from Froebel that can be drawn through the lives of every architect at the Faye Jones School, as our noted Arkansas Architect E. Faye Jones was a disciple of Frank Lloyd Wright. And what is it that Architects could learn from Friedrich Froebel in this day? The artist may look at the world for the sake of illustration, as being composed of "positive" and "negative" space. I'll note that the "negative space" that surrounds the object is not "empty" space. It is full of the relationships through time and space that connect it, just as Friedrich Froebel sought to "connect" each child with the wonders of nature and human relationships within which each of us exist. We are trained from birth to grasp hungrily at our individuality and separateness, and yet the truth of our situation is that we are deeply connected. I am reminded of the story of a zen master, who on his death bed, was surrounded by monks crying, "Please master, please don't leave us." He looked up and asked "where do you think I might go?" From the standpoint of "negative," relational space, there is just one of us. We are an interconnected wholeness, the complete sense of which Froebel had hoped to awaken in each child. I hope to practice that for myself as an art. And so today, that will be my hope and my goal at the E. Faye Jones School of Architecture. This morning I went to the Eureka Springs Hospital for a very minor medical investigation procedure and for some reason decided to wear a Fine Woodworking shirt I had been given as a regular contributor to that magazine. The radiologist asked if I was a woodworker. He told me about a year-long apprenticeship he had been able to participate in with Ohio furniture maker Arden Riddle. You can read about Riddle's furniture here: https://www.cantonart.org/exhibits/arden-riddle-master-mid-century-design-august-16-2018-october-28-2018 An exhibit of Riddle's work closed in October at the Canton Museum of Art. As an apprentice, my radiologist had worked on one small table for almost a year, so we discussed what it takes to arrive at an understanding of quality, and whether or not that understanding of what it takes to attain quality can be transferred to different realm of endeavor. It is my belief that if you can rise up to do one thing well, you will have discovered the means through which to attain a high level of quality in other things. The primary material and means (and obstacle) at hand is oneself. I'll not post pictures of Riddle's work, as the link to the exhibit will suffice. The following link is to a video review of the exhibit. https://youtu.be/Z1eXGvDgRJo In addition to being a quality craftsman, Arden Riddle was of quality when measured through the kindness he expressed to others. It is rare for people to want to surround themselves in the adventurous work of assholes, and being kind seems to be an important ingredient in being granted the opportunity to excel. 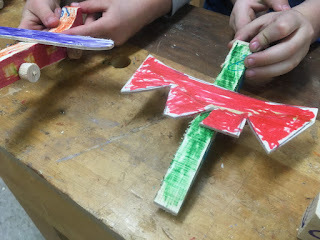 Yesterday my first grade boys made airplanes. One said, "I need blasters." "What are blasters?" I asked. But give a boy some scraps of wood, and he'll have wonders to perform. let us live with our children. "Let us live with our children," was the motto associated with Friedrich Froebel. He did not say, "Let us live for our children," as a suggestion of slavery. He did not say "Let our children live for us," as a suggestion of slavery in the other direction. My sister Sue sent a quote this AM from contemporary British painter David Hockney, that "People tend to forget that play is serious." Play is in fact the way we learn best and the way that we as adults impart values. We play by the rules of the game so that our children may also. Generally, the rules are easy to understand. We do our best for ourselves and those around us. And in all seriousness, we are called to give freely of ourselves to each other. I believe that's what Froebel had in mind. These are great simple rules for school and for life. Our dog Rosie and I took our first adventure yesterday into the wilds of Eureka. We attended the annual Preservation Society's Tour of Homes. (Outside the houses, of course.) Rosie was frightened by the traffic, but enamored with the people. She could not get enough pets or give enough licks. The process in puppy training parlance is "socialization." And it points to the lack of wisdom in American education when we sequester children for long hours without engagement in real life. A friend had asked about the meaning of progressive education. While very young pups, dogs stay very close to their mothers. As they become more aware, their litter mates play an important part in their socialization process. As they mature, their consciousness transcends the litter toward engagement in the real world, and that, too, is a gradual process. The pup learns its role in nature and society at large. And that is the process we can call "progressive education." It is natural to the dog or to the child. As the child grows, its sense of self grows also. Froebel had devised a scheme for that in his creation of Kindergarten, and most of what he attempted to teach has been abandoned as submerging the child in reading and math have taken precedence over all else. 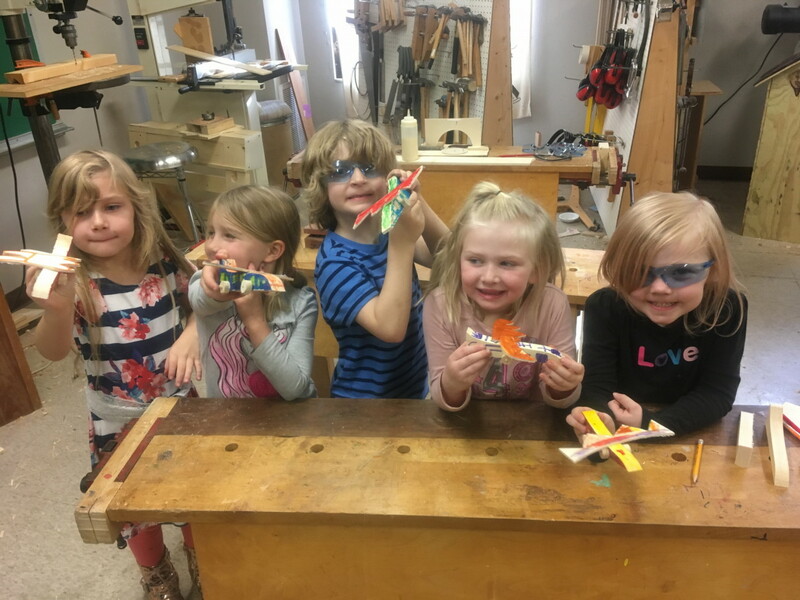 A few years back when I attended a conference at the University of Helsinki, I grew weary of lectures, and escaped to the university wood shop, where Kindergarten teachers working on their masters in education degrees were learning to teach woodworking. They, my friends, were on the right track. The photo is a Kindergarten student's airplane. 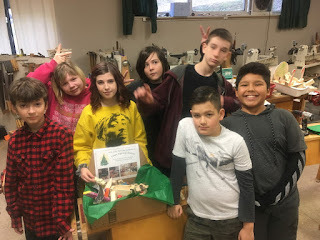 Yesterday in wood shop at the Clear Spring School I gave my 5th and 6th grade students an exercise in reading plans and building birdhouses. They would rather not be bothered with plans, but I tried to explain that previous generations of woodworkers and birding enthusiasts had refined designs for blue bird houses based on a multitude of prototypes and countless hours of direct observation in their use. Can we not rely on the civilization in which we live to provide a starting point for our own creative endeavors? Would we not build society more effectively if we were to show some homage to the past and the efforts of others? Reading plans is not easy for my students, many of whom are "great readers." When you read a normal book, you can skip parts and know that you've not missed much. When reading a how-to book or a set of plans, if you miss one small detail, much can go awry. 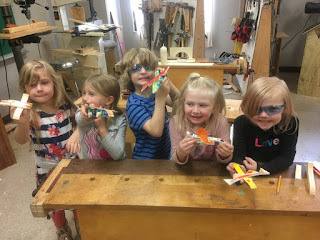 In my Kindergarten woodworking class, we made toy airplanes. An important principle of Educational Sloyd was that students begin with the known and work toward the unknown. These days, just as all children in the day of Sloyd were familiar with the knife, students are well prepared in the use of markers to color their work. Having the stock prepared in advance, I started the students out using markers in decorating the fuselages of their planes. Then using thin Baltic birch ply, they designed the shape of their wings, which I then cut out. Starting with the markers spaced the students out so that not all were requiring the same help at the same time. With the fuselages complete to the student's satisfaction, drilling holes for the axles to fit came next. I held the fuselages in positions the students directed while they drilled the holes. I helped next by adding the wheels and axles which I had prepared in advance, and one of my 6th grade students, Gracie, assisted next in using hot melt glue to affix the wings in positions decided upon by the students. Our Kindergarten teacher asked how I can have new projects each week that can be completed in 30 minutes time. Part of the answer to that is that I prepare stock in advance, start students out working on the parts that are most familiar to them, and that I have help. The students are very proud of their work. Make, fix, and create... Give others the chance to learn likewise.